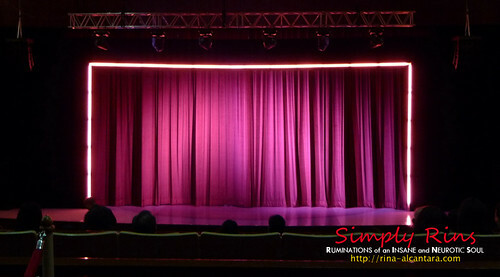 I caught the last matinee showing of Legally Blonde the Musical at Meralco Theater here in Manila last July 18, 2010. It has been a long time since I watched a musical. I think the last theater play I watched was Zaturnah at the Cultural Center of the Philippines (CCP). As I have mentioned in my previous Legally Blonde the Musical entry, I am a fan of Elle Woods and of course, the movie from which the musical was based. The character of Elle is a classic example of not judging a book by its cover. The stage was also wearing Elle Woods' signature color - hot pink! I don't really watch a lot of TV and so I really don't know how Nikki Gil as a singer and as a performer. I have to say however, that I really did enjoy her performance. She portrayed Elle Woods quite brilliantly. I could have enjoyed the songs more though, if I could actually understand the words. I don't know whether it was the theater's sound system or the fact that the songs where mostly fast in tempo. Regardless, the Legally Blonde the Musical was quirky and very entertaining. Congratulations to Nikki Gil and the entire cast for a fabulous performance! The performance of Geneva Cruz is outstanding! She did very well in portraying the character of Brooke Wyndham, the exercise guru. I particularly enjoyed her 1st number when her character was introduced during the play. It must have been hard jumping and singing at the same time! A small exhibit of the costumes was setup immediately outside the auditorium. 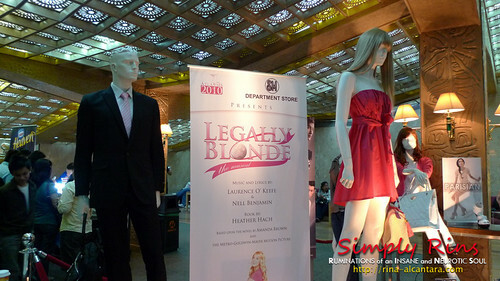 SM Department Store and Parisian shoes provided the costumes for the Legally Blonde the Musical here in the Philippines. If you're interested in any of the clothes wore by the cast, you can visit any SM Department Store. Legally Blonde the Musical ran from June 25 to July 18, 2010 here in Manila, Philippines. What? You failed to see Nikki Gil as Elle Woods? "Omigod you guys!